If you follow a paleo diet, a quick drive-thru dinner isn't an option when you're in a rush. Here are 4 protein-packed meals you can make in under 30 minutes! It's 5:30 p.m. and you're finally heading out of the office after a long day. The rain is coming down, and the radio says there are two accidents on your route home. Looks like your normal 15-minute commute is about to become 45. This wasn't how you envisioned your night. On top of that, you still have to make dinner. But since you follow a Paleo-style approach to eating, simply heating up a precooked meal or grabbing a processed bar is out of the question. You may as well take a detour left into the forest and begin hunting your next meal. Fortunately, there are many Paleo-friendly meals that can be made in the blink of an eye. Here are four protein-packed options to get you (grass) fed in about 30 minutes! This low-carb stew tastes like your favorite jambalaya, but with all the spicy flavor going on, you won't miss the usual accompanying rice! This healthy taco salad recipe is the perfect stress reliever after a long day of work. Prepping bigger batches takes almost no extra time, providing delicious dinners for days to come. Even made days ahead of time, these spicy salads won't get soggy! 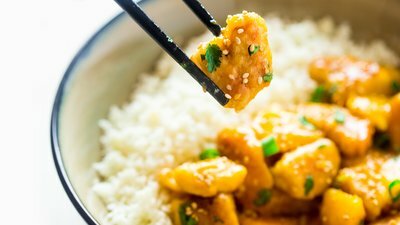 This simple-to-make, low-carb mango chicken is served over coconut cauliflower rice. With a little fresh ginger and habanero, it packs a flavorful punch! This orange beef stir-fry is packed with healthy carbs, green, and protein. And it can all be on your plate in under 30 minutes! Taylor is the blogger, recipe developer, photographer, and general mess-maker behind the blog Food Faith Fitness.